Today, Gov. Tom Wolf announced May 21, the same day as the Pennsylvania primary, as the special election date to fill the seat just vacated by Rep. Tom Marino (R-Lycoming). Marino announced last week that he was resigning from office to take a position in the private sector. His last day in office was yesterday. 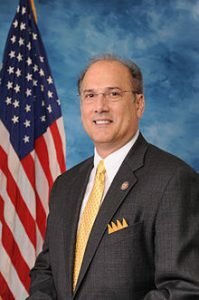 Marino was the first Republican Congressman in Pennsylvania to endorse President Donald Trump in the 2016 GOP Primary and only the fifth member of Congress to vow support for him according to Politico. Trump selected Marino to be the director of the Office of National Drug Control Policy, but was never confirmed, in part due to a Washington Post/60 Minutes report detailing his role pushing a bill that “undermined” the DEA. Marino was first elected to Congress in 2010 and just began serving his fifth term earlier this month. The 12th Congressional District is a GOP stronghold that voted for President Donald Trump by 35 plus points in 2016 and where Marino coasted to victory this past November. According to WJAC, the only candidate to formally announce a bid for the seat is Democrat Marc Friedenberg who lost to Marino in 2018. A number of Republicans are expected to join the race in the GOP friendly district. The parties will pick the candidates to run in the special election. My Name is also Zakrey Bissell and i am from Liverpool New York and I am not running for congress or any office at this time and if there’s a another Zakrey Bissell from Pennsylvania is running for congress in the Special Election race in Pennsylvania’s 12th Congressional District and i do wish him a good luck and i will be supporting the Republican Nominee for the special election in 2019. How can you be contacted, Zakrey? There is at least one other person also expressing interest as the Libertarian Party nominee.